I’m thinking of the folks in Boston as I write. As a Denver, CO resident, I know too well the sorrow of events of this nature and how it can impact an entire city so my heart and my prayers are with them today. Along with that sorrow though comes hope; seeing evidence of the bounty of good when crisis befalls us is testimony to the true human nature of citizens of this magnificent country of ours. From the everyday citizens who rose to the occasion to the amazing show of grace by the leaders, first responders; police and firefighters, you did Boston proud. To everyone in Boston, stay Boston Strong. For me, one piece of the puzzle of my life’s craziness is over. Three months of nonstop cleaning, home showings and packing have come to an end and I’m officially moved out of my home of 22 years. I’m living with friends and though I do miss my own home; they have been so supportive and understand my need to concentrate on my daughter for a bit and put the house-hunting into perspective; rushing that decision now would be a mistake. So I’ll try to enjoy this respite (while so missing my kitchen) and will also try to enjoy some time free of the responsibilities of home ownership. Thankfully Karen has a lovely garden; that will help me transition more easily I’m sure! I simply can not thank enough all of the folks who have stepped up and done some guest posts for me over the last several weeks. Both local friends and those from afar…and today’s post is pretty doggone far! Rachel of the Rachel Cooks blog has helped with this post today; she is in Michigan which, though far away, has such great memories for me. That year my friend and I drove from St. Louis to Petoskey, MI and had the time of our lives after meeting some young men whose only job for the summer was taking care of their Daddy’s yacht. Tough one huh? Or the spring my ex and I hunted for morel mushrooms and discovered a cache that fed us for several meals; I don’t think I’ve had any since that could compare! Rachel is a huge multi-tasker – staying at home with 2 young children is a big job in itself but she does so with aplomb; all the while sharing fabulous foods from her kitchen on her blog. Please welcome Rachel and make sure you scurry over and check out her blog…it’s good stuff! Hi everyone! I’m Rachel from Rachel Cooks and I’m so happy to be able to help Barb with a guest post while she’s busy with things which are far more important. It’s so hard when you have friends that don’t live nearby. You can’t give a hug, you can’t make a meal, you can’t clean their house…but what I can do, besides pray, is write a guest post. 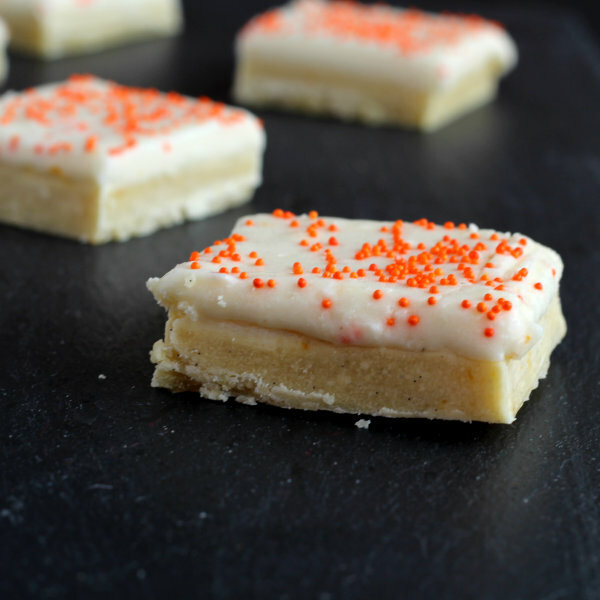 I made these Orange Creamsicle Cookie Bars and they are sure to brighten your day, even if only for a minute. They have a bright flavor from the fresh orange zest and a richness from the luxurious vanilla beans. I’d put vanilla beans in just about everything if I could! These are super easy to make and you can store them in the freezer until you’re ready to eat them. Or…you can eat them straight out of the freezer. I’m not saying I know anything about that though…. So do me a favor — if you live near Barb, make her a big batch of them and give her a giant hug from me. Verdict: Loved these—ate way too many of them. Husband’s take: He liked these too. I didn’t think he would, he’s more of the plain ol’ chocolate chip cookie kind of guy but he really did enjoy these. I’d love for you to stop by Rachel Cooks and say hi some time! Love a Creamsicle ice cream bar? Then you'll love these! In the bowl of a stand mixer using the paddle attachment, cream together butter, salt, sugar, orange zest and vanilla beans. Add egg yolks and mix well. Add flour and mix until a dough forms. « Margaritaville – Get Ready for Summer with these Beauties! Wow, these look delicious, and what a creative play on the favorite childhood treat!! My favorite childhood treat even so I love these bars. Your daughter’s hair will grow back and in a little while all this will just be a bad memory. Wonderful things are being done today with cancer and the chemo is much better than it was years ago. I send her nothing but good wishes for the speediest and most complete recovery that she can make and years and years being cancer free. She’ll be in my prayers. These cookies sound amazing. The creamsicles were a bit different when I was a kid (all those years ago – like the 1950s). The orange outside was real orange ice cream not the sherbet that they use today. I really did like them better then. I went to the store and bought what I needed to make these today and that’s my mission for tomorrow. You take care of yourself too, because you have continue to be strong to care for your daughter. God bless. Thank you Jo…for the words of encouragement for both of us. She is really doing great. As I’ve told people the shock of getting breast cancer at her young age is somewhat balanced by her young age fighting it so well. Her hair was her crowning glory and probably the toughest thing she has had to deal with but I think she sees better now that it was just hair and she is about more than hair. I loved those same creamsicles as a girl…makes me want to try and re-create an orange/vanilla ice cream for the blog…hmm, now you’ve got me thinking…sure I can do that! The bars look great. Thanks for the hug to Boston. I hope your daughter is doing well with her treatments. Sending positive energy your way. Thanks so much; she is managing treatment pretty well so far. After losing your hair I guess some heartburn is almost insignificant! I love Boston and I loved the people I met there. We’ve suffered enough heartache in Denver too so I always feel such huge empathy…and Boston did themselves proud. Nothing wrong with simple baking Becky! You can substitute equal amounts of vanilla extract for vanilla bean paste. If the recipe calls for a teaspoon of vanilla paste, simply use a teaspoon of vanilla extract. You can get Vanila Bean Paste at spice shops and online and I do like it; it offers a much simpler way of adding real vanilla beans to a dish in lieu of having to scrape the seeds out of a bean pod. It’s sort of trendy for sure and good…but not absolutely necessary either! What about a substitute for the vanilla beans? Can I use vanilla extract as well? and if so how much? You can substitute extract Brooke for either the beans or the paste called for in the recipe. In each instance, simply use 1 teaspoon of extract. What a great cookie! I used to love orange creamsicles when I was a kid, but it’s been years since I’ve had one. These will definitely bring back memories! Great guest post – thanks. I am going to make these for my SIL’s birthday party – I’m throwing. My niece loves all things creamsicle! My husband would love these! I go to the store and get ingredient’s so i can have them ready before he gets off of work! They look great! Oooh…. these bars sound addictive.. in a good way!! !Congrats on the move Barb – soooo good to have that behind you! Having lived in Boston for a year, it has come into my thoughts a lot over the last week. It’s such a strong city and I know that they’ll come out of this stronger. Also, these bars look amazing! Sending huge hugs to Barb and her daughter. You know, for good people things always turn out well in the end. Love and patience go a long way and are truly the best medicine. 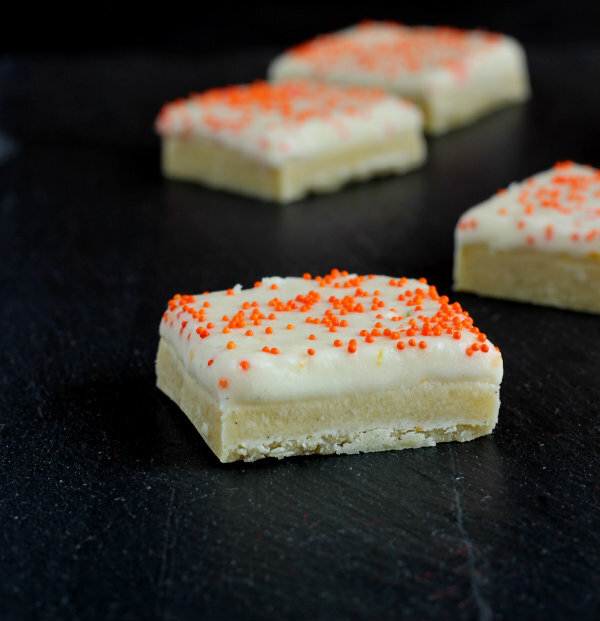 And I agree that she does need a batch (or two) of these luscious orange bars! Oh my gosh these sound so good! I think Id also eat way too many, am saving this for my “to make” list! 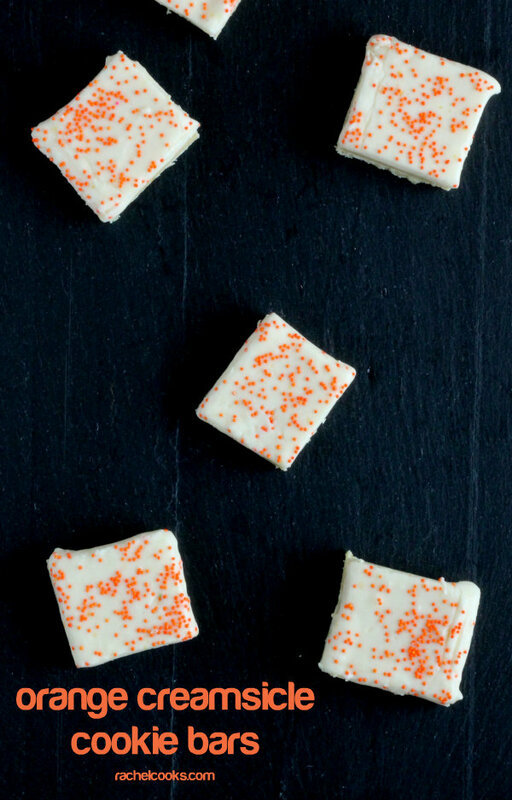 These remind me of a friend’s orange shortbread cookies that I just adore. I love them with a cup of Earl Grey on a long lazy afternoon. Ok, now I know what’s on the recipe docket for next week.